The concept of soil-forming processes (e.g., humification, formation of clay, formation of soil, mixing of soil, and gleying) is of fundamental importance for genetic soil science and soil geography. 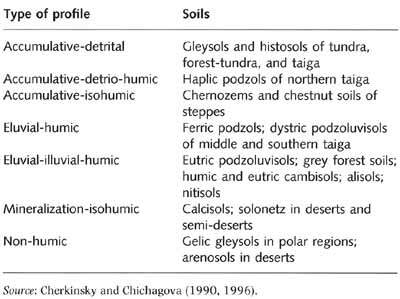 Ideas about soil-forming processes as an instrument for studying soil origin have been developed and applied by many prominent soil scientists: Kovda (1946, 1947); Gerasimov (1976); Rode (1976); Glazovskaya (1981); Duchaufour (1982); Zonn (1987); and Sokolov (1993). The original Dokuchaev scheme 'soil properties-soil-forming factors' has been modified by Gerasimov (1976) as 'soil properties-soil-forming processes-soil-forming factors'. Many aspects of this concept are contradictory and insufficiently researched and approaches reflect different levels of complexity, hierarchy, and interaction with soil-forming factors (Elementarnye, 1992; Chernyakhovsky, 1994; Zamotaev and Targulian, 1994). Processes of organic matter metamorphism play an important profile-forming role both in humid and arid environments. These processes include transformation of organic remains, humification, mineralization, formation of complexes, and migration of humification products (Grichina and Orlov, 1978; Chichagova and Cherkinsky, 1979,1985;Dergacheva, 1984; Trofimov and Dorofeyeva, 1994). The organogenous and/or organic-mineral zones are distinguished according to the amount of organic matter, its distribution across the profile and at the surface, and quality indices, such as degree of decomposition, type of humus, and its enrichment by nitrogen. Seven main types of organic profiles, which are distinguished in Northern Eurasia, are listed in Table 4.3. The formation of clay minerals in В horizons in the soils of northern Eurasia is controlled by two main processes of biochemical weathering: sialitization and ferrallitization. The former occurs in humid cold and temperate regions, in warm arid and semi-arid regions, and sub-humid subtropical environments; the latter develops in humid subtropical conditions. The term 'subhumid subtropics', referring to the subtropical regions which annually receive between 1300 and 1500 mm of precipitation, is used in Russian soil science to distinguish between the areas where kaolinite-smectites develop (humid subtropics with up to 2500 mm of precipitation per annum) or do not develop (subhumid subtropics). Across large areas, parent rocks accumulated clay products of different mineral composition (smectite-hydromica, hydromica, kaolinite-smectite, and kaolinite) during previous cycles of lithogenesis (Sokolova, 1985; Chernyakhovsky, 1991). Under the present climatic and biotic conditions, these clay associations do not undergo significant transformations by the processes of intrasoil weathering. Therefore, under humid cold and temperate and to a certain extent under warm semi-arid conditions sialitization occurs due to the selective partial or full biochemical dissolution of non-laminate minerals (calcite, feldspars, pyroxenes, and hornblendes). Laminate silicates of the parent rock (biotite, muscovite, chlorite, and smectite) are weathered or destroyed by mechanisms of hydration and degradational transformation. For this reason, in cold and temperate humid climates only vermiculite is formed as a result of biochemical weathering. Because of selective decomposition of non-laminate minerals, leaching of carbonates and weak transformation changes of laminar silicates, the most stable mineral associations are accumulated in the soil profile. In the case of weathering of acid rocks and their sedimentary derivatives, the stable minerals are quartz and dioctahedric micas. In the case of weathering of middle and basic rocks and their sedimentary derivatives, black-coloured minerals, hydromicas, and vermiculites are the predominant products of the transformation of micas and chlorites of the parent rock. The relative stability of laminate alumo-silicate minerals, inherited from parent rocks, is one of the principal causes of the observed silitization in podzols, podzoluvisols of taiga, grey soils of forest-steppe, and cambisols of deciduous forests, and to a lesser degree in chernozems and chestnut soils of steppes. In the subhumid subtropics, on the Russian part of the Black Sea coast (which is considered 'subtropical' with respect to the soil-forming processes in contrast to climatic classifications) and the foothills of the Talysh mountains, sialitization occurs through the dissolution of minerals of non-laminar structure and degradational transformation of trioctahedric micas, chlorites and mixed-laminar formations. It develops further than in the soils of cold and temperate regions. Sialitization leads to the accumulation of trioctahedric and sometimes dioctahedric smectite which binds most of the iron in the soil. This is the final stage of degradational transformation of these minerals. Due to the stability of smectites, insignificant amounts of iron, released in the course of the destruction of pyroxenes, hornblendes, and chlorites, is insufficient to produce dense pigmentation of the soil. Moreover, after iron is released from minerals into the upper horizons of the soil profile, it is bound into mobile organomineral complexes and is almost completely removed from the soil profile. Therefore, there are no conditions for the formation of red and mottled colours and soils, termed yellow earths or alisols, to develop. Ferrallitization occurs only in a relatively small area of the humid subtropics in western Georgia, where high rainfall provides continuous moistening and a deep washing regime throughout the year. Observations have shown that in order to initiate ferrallitization, the annual amount of rain should exceed 1400 mm (Chernyakhovsky, 1991). However, the potential formation of minerals of the kaolinite group and iron and aluminium oxides-hydroxides in western Georgia is often hampered by the occurrence of the older oligomictous quartz-kaolinite or gibbsite-goethite-kaolinite rocks. These rocks cannot be transformed by weathering to any significant extent even if other conditions are satisfied (Zonn, 1987; Romashkevich, 1974, 1988). Complete ferrallitization occurs through weathering in the mountains where young rocks are exposed by active tectonic processes and erosion rates exceed weathering rates. Soils, termed red earths or nitisols, are formed under these conditions. They are distinguished by a clay profile with a clear differentiation of the genetic horizons, where minerals with kaolinite and kaolinite-smectite mixed-laminar structures have a rock-forming importance, and have dense red and mottled colours. Aluminium-iron (Al-Fe)-humus eluviation is one of the most common processes. It refers to the combination of such processes as mobilization of low molecular humic matter by iron and aluminium, the formation and removal of stable complex and chelate organomineral compounds. Al-Fe-humus eluviation is typical of soils which have developed on substrata with coarse grains, as these provide conditions for the free migration of solutions. In humid boreal regions, this process leads to the formation of soils with eluvial horizons (El) such as haplic and ferric podzols on acid rocks enriched by quartz and poor in bases and sesquioxides. On the rocks, rich in bases, sesquioxides, and minerals which are easily weathered, soils without El horizons develop. Podburs, otherwise known as cambic podzols, belong to this type. The term 'podburs' is widely used in Russian-language literature but it is not much used elsewhere. Al-Fe-humus illuviation is genetically connected with Al-Fe-humus eluviation and develops in the same profiles. It refers to the process of removal of Fe and Al oxides and organic matter in organomineral forms and their subsequent deposition. One or several illuvial horizons (illuvial-ferrogenous, illuvial-humic-ferrogenous and illuvial-Al-Fe-humic), enriched by oxides and sometimes by humus in comparison to the over- and underlying soil horizons, are formed. Al-Fe-humus illuviation and Al-Fe-humus eluviation are often viewed as the two aspects of the same process otherwise known as true podzolization (Duchaufour, 1982). The eluvial-illuvial differentiation of profiles in the humid section of soil formation may be caused by other processes such as lessivage and gley migration of iron and manganese. Lessivage is the process of washing of clay particles without any change in their chemical composition out of the eluvial horizon and their accumulation at depth as local or complete drapes or cutans at the surface of peds, rock fragments, and walls of pores. Intensive lessivage develops in humid and semi-humid regions, in soils forming on loose Quaternary deposits enriched by fine particles. Lessivage is one of the profile-forming processes in dystric and eutric podzoluvisols. It forms a series of diagnostic indices in stagnic podzoluvisols, grey forest soils, alisols, and nitisols. The process of gley migration of iron and manganese is as the movement of anaerobically recovered forms of Fe2+ and Mn2+ in gels of organomineral complexes, salts of mineral acids with subsequent oxidization and accumulation of Fe3+ and Mn3+ hydroxides in the soil profile or outside. In soils, developing on loams and clays, this process is connected with surface water, while in soils, developing on sandy and silty rocks, it is affected by ground water. Although this process occurs in all humid regions, it has a profile-forming function in gleysols. It is a direct result of gleying. Gleying is a process of soil transformation under conditions of permanent or continuous waterlogging. Gleying of soils is characterized by the formation of light blue or greenish colours (Karavaeva, 1982). Gleying is typical of soils of all zones of Northern Eurasia. However, it is most common in humid and subhumid environments with waterlogging. It takes place both in autonomous soils on watersheds and in heteronomous soils in depressions (e.g., umbric gleysols, gleyic chernozems, and mollic gleysols). In arid environments, gleying is linked to ground and soil-ground waters and occurs in heteronomous soils of meadows, wetlands, and various solonchaks (salinized soils). Salinization is particularly widespread in arid environments while in humid regions saline soils occur only locally. It may develop in soils or individual horizons of a soil profile in response to seasonal and perennial variability in salt balance. Aridity and widespread occurrence of salt-bearing rocks stimulate Salinization of soils in steppes, semi-deserts, and deserts. Solonchaks are formed as a result of this process. Solonetz formation is one of the profile-forming processes typical of the arid zone. It refers to the accumulation of exchangeable sodium in the soil's absorbing complex with a relatively low concentration of salts and an alkali reaction in the soil solution. The most favourable conditions for the formation of solonetz soils are those of long-term salt accumulation such as deltas, river and marine terraces in typical and southern steppes and semi-deserts. Solodization is the replacement of absorbed sodium by hydrogen which leads to hydrolithic splitting of minerals of the soil's absorbing complex and desilting of the upper part of the soil profile. Solodization develops in response to the occurrence of contrasting moisture regimes. For example, in steppes and forest-steppes, waterlogging takes place in topographic depressions where intersoil drainage is limited, while in dry periods this regime is replaced by a weak capillary regime.